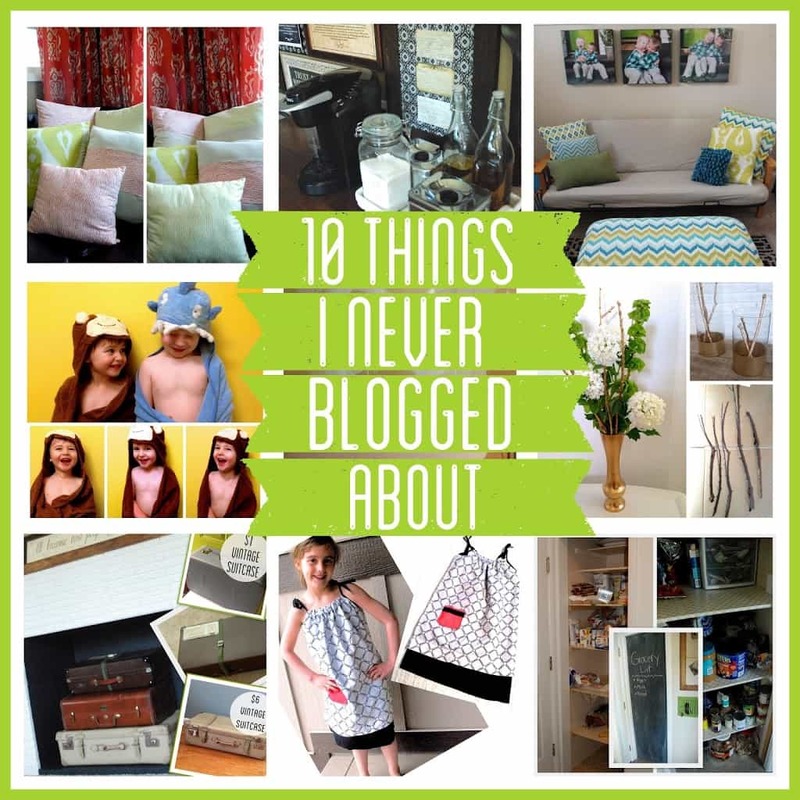 Maybe you were hoping for some juicy, deep stuff, but I’m sorry, I don’t have it, instead what I do have is 10 different things that for one reason or another never made it on the blog. Some I forgot to blog, others didn’t seem significant enough for their own blog post, so today you get them all! #1- Envelope pillows. 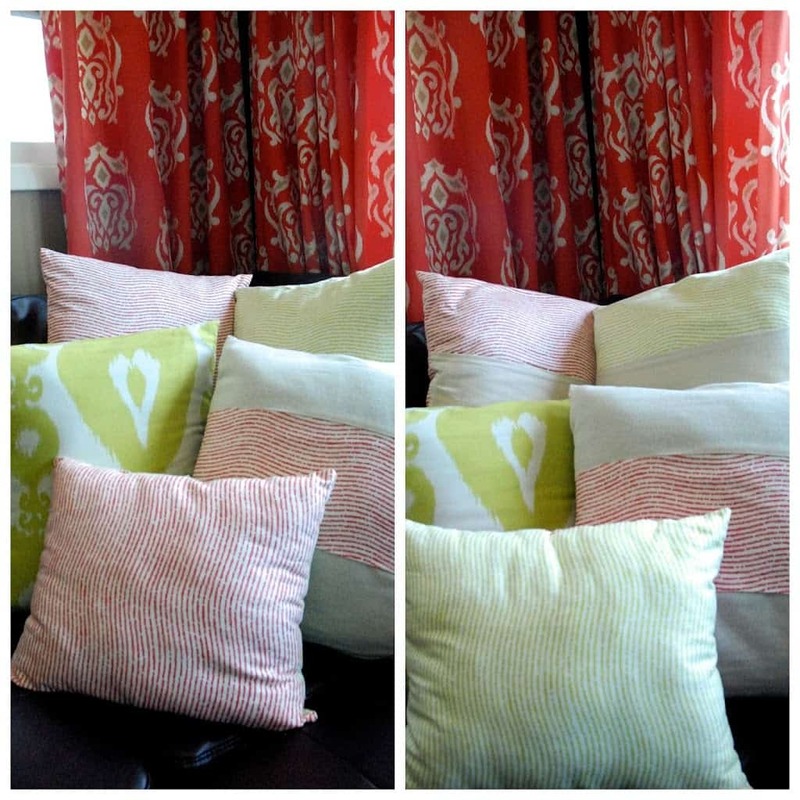 I made these six pillow covers using this tutorial to cover the purple pillows that I got at a garage sale for $4. They were part of my goal to brighten up the living room and I love them. I made them all reversible with a coordinating fabric across the middle of one side. #2- The graffiti “cover-up”. 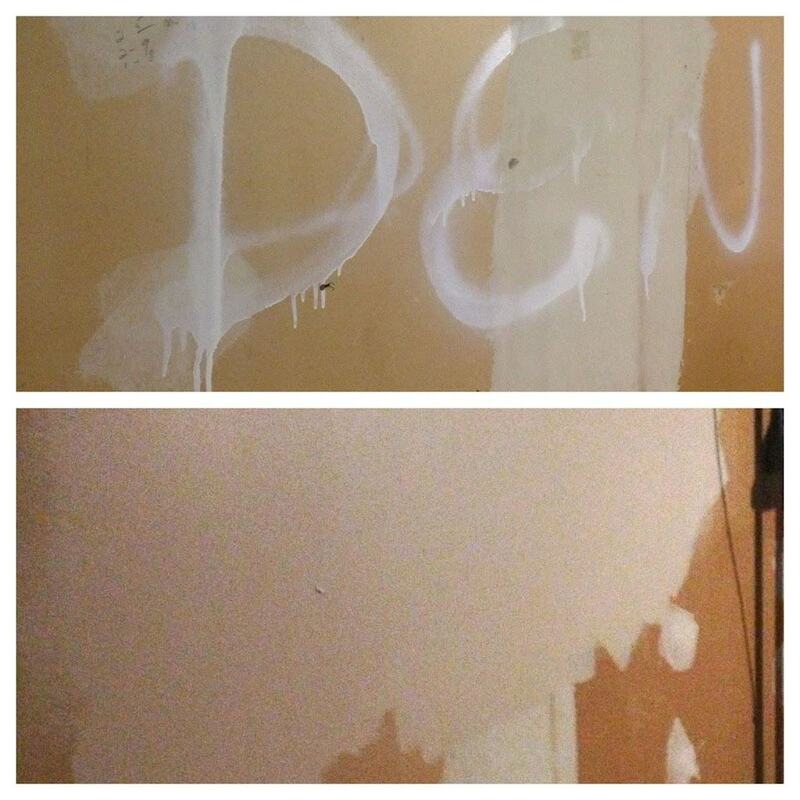 Yep… when we bought our house there was vulgarity written on the utility room wall. I’ll let you deduce what it said. dI don’t know why it took me almost a year to paint over it, but one day when I was painting I took care of it once and for all. 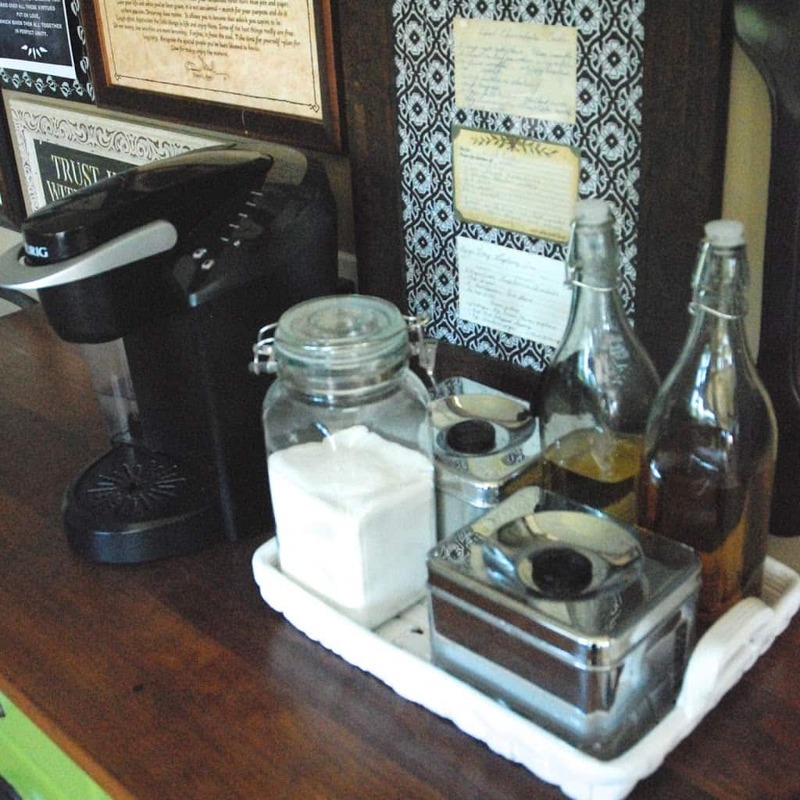 #3- Coffee Station. I host play group pretty often, and I want everyone to feel welcome to make their coffee or tea how they want, without having to ask where everything is. I picked up this Williams Sonoma ceramic tray from the thrift store. On it I just put two syrups, creamer, tea, sugar, and K-cups. Now everyone knows that when they come over they are welcome to help themselves to the coffee of their choice. 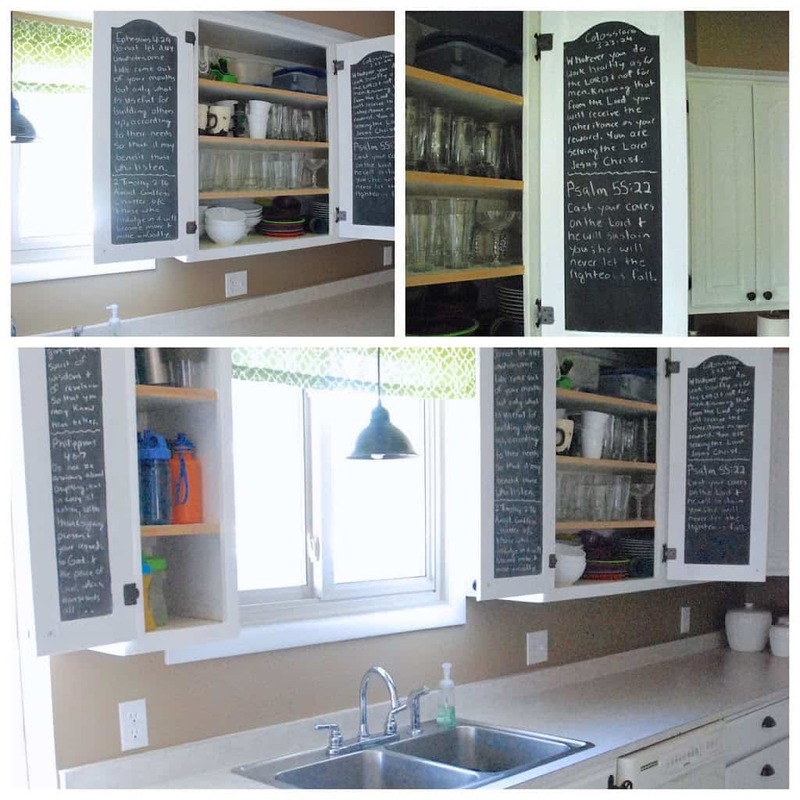 #4- Chalkboard Painted Inner Cabinet Doors. I’m working on memorizing 2 Bible verses per month in 2013, and I discovered the best time for me to work on my verses is loading and unloading the dishwasher. One day when I was going chalkboard paint crazy on my pantry, closet door, & crockpot, I decided to paint these too. 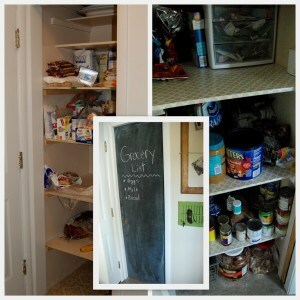 It has worked out great and all the verses that fit on the cabinet doors are the ones I know the best! #5- Post-bath Cuties- This is not a DIY project, but just too cute not to be shared! 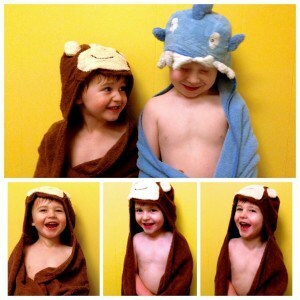 Aren’t they so stinking cute in their towels?? #6- More Envelope Pillows- Remember my plan to add color to the drab basement for cheap?? 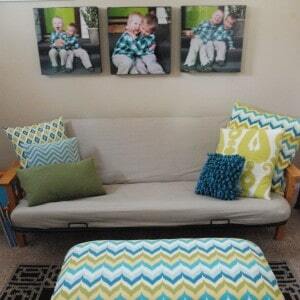 These pillows were definitely the way to do it! All the pillows underneath were picked up from a friend’s garage sale, but with coordinating fabrics on top I love the way they look! #7- Gold Painted Sticks- When I painted my “curtain rod” sticks gold, I decided to paint a bunch of little sticks gold too for random decor throughout the house. 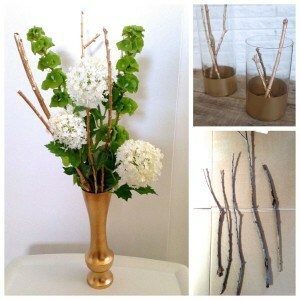 I love the way they look along in a glass vase, or along side flowers in an arrangement. It’s a perfect little modern touch. 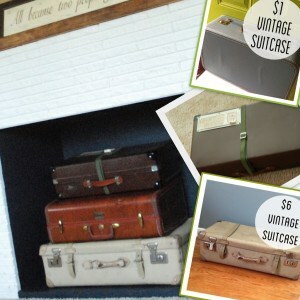 #8- Suitcase Fireplace- All summer I’ve been picking up vintage suitcases anywhere I can and the fireplace was the perfect place to put them to use! My friend Jenn actually traded me my blue one for her brown one, which works a lot better in my house. I’ve only got like 8 more suitcases that still need a home. #9- Contact Paper Pantry- When we moved into our house Matt turned a coat closet into a pantry and I just lived with the plywood shelves for the last year. Finally I picked up this cute quatrefoil contact paper from Ace and covered each shelf. What an improvement! Thankfully most of the time you can’t see it when I shut the chalkboard pocket door. 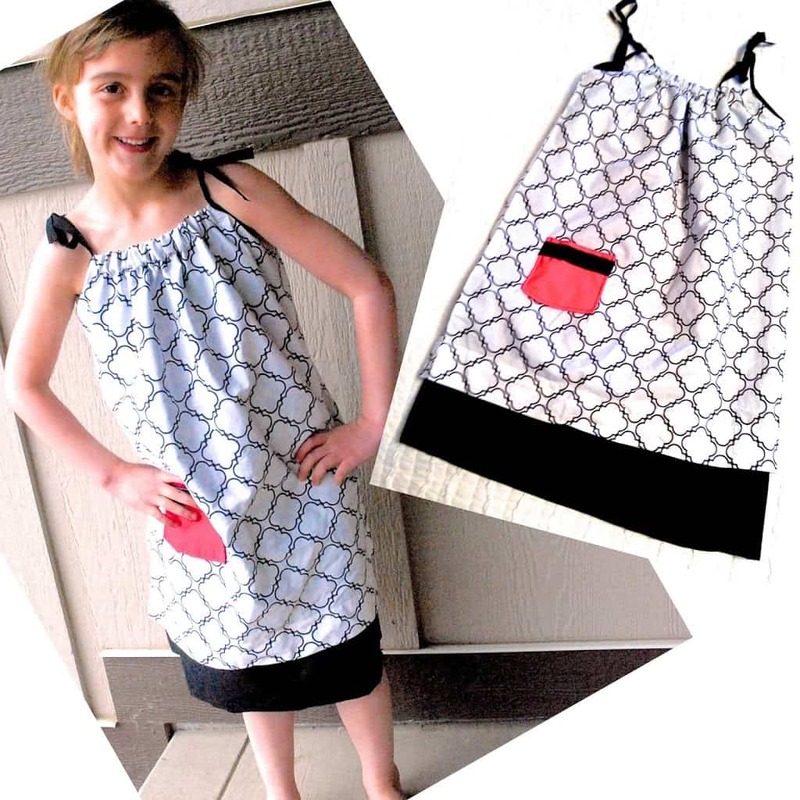 #10- Pillowcase Dress- My friend Lindsey introduced me to “Dress a Girl Around the World” which is a neat organization that gets pillowcase dresses to girls in 3rd world countries who might never own a new dress in their life (especially a modest one). Her and I got together to make this one to ship out! This is my friend Jenn’s sweet little girl modeling it. Hopefully this fall we’re going to have a “pillowcase party” to teach friends how to make these dresses and ship a bunch out. So… if you have extra pillowcases, or if you come across cute ones at thrift stores or garage sales I would LOVE it if you’d pick them up for us!!! 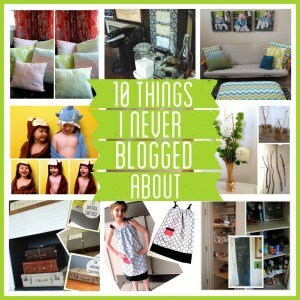 Well… there it is, 10 Random Things I never blogged about. Which was your favorite? ?